Air is an important element of the environment. Nothing reminds this more than Scorching Summer days. One can also feel the heat after intense outdoor sports or other activities. Just like us, our houses get affected by heat too. We need to cool the rooms down by cooling the air itself. Yet, that’s only half the story. One needs to KEEP the rooms cool too! People go for variable methods including buying an AC or two to cool off. However, with the economy and price hike in mind, buying an AC isn’t such a good financial option. This might surprise you but there are numerous ways to keep indoors cool. Nowadays, the best box fans can mimic what an AC can do. If you want to save some bucks while remaining cool, these are a viable option. Plus, these things come with plenty of features and benefits of their own. Hence, I designed this article with some of my suggestions regarding top-of-the-line products, a simple buying guide and few instructions to play it safe with these fans. Enjoy! It’s not often when I find multiple products that are worthy of being called the “Best” in the business. Yet, here they are. Below you’ll find some of the best rated box fans going around today by critics and customers alike. Choose one that’s suitable for you. Lasko is a brand of cooling fans that you can easily rely on. 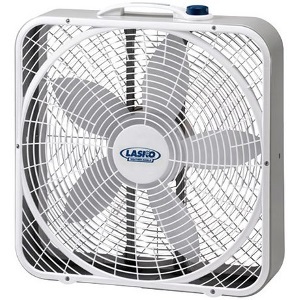 Just consider the Lasko #3720 box fan. This box fan is 20 inches in diameter and 20 inches in width. That is, although as a box fan it does not allow a rotating fan head, it can cover any room in your house. Normally, box fans such as the #3720 are meant to be set up on the floor or any flat surface for that matter. It’s 5 aptly pitched wings provide a steady and strong wind current that can make any hot day bearable. Lasko has manufactured this box fan to be used as a window fan as well. The fan is built with Weather Shield Motor. And this Weather Shield Motor can withstand all kinds of harsh weathers (rain/storm) when you set it up on your window. The best thing about box-style fans is that they are very easy to use. You simply need to plug in the fan, switch it on and then select your desired speed. The speed regulating dial is set up on top of the box fan for easy access. This comes handy when people set up on near the floor. Lasko #3720 is lightweight and so very easy to carry around. The makers have equipped this fan with a patented safety plug that switches off the fan in case of an emergency. They have thus made sure that the #3720 stands out to be the best box fan you can find. This box fan comes with three levels of speed which is a lot for a fan of this category. The carry handle makes Lasko 3720 easy to carry. This is a lightweight fan too. This little product keeps users safe as it utilizes a patented safety system from Lasko. This model uses simplified controls that are on top of the fan for easier access. One can use Lasko #3720 as a window fan if he/she chooses to. The fan is a bit loud when you put it on the highest level of speed. Some of the users often complain about this thing shaking when you run it on “High” speed. Holmes manufactures their products with durability, affordability and high customer ratings. 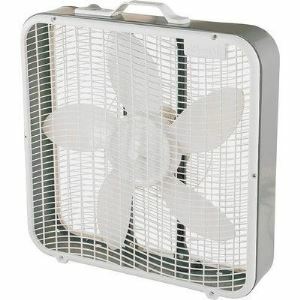 The 20-inch Holmes box fan is one of such products. It is 20 inches high and 20 inches wide. The fan has a slim body that lets you store the whole thing almost anywhere in the house. The front and back grills are gridded and the blades have got the necessary pitch to provide a strong and steady air current. You can set up the fan on any flat surface. Plus, it comes with a pair of attachable feet that provides added stability. One can choose among three speed settings – high, medium, and low. Holmes does not say anything about using this product as a window fan. So, it is better to use indoors only. This Holmes product is one of the best 20-inch box fans right now. Some people find cleaning fans a bothersome job. But cleaning this box fan is a very easy job. The front grill is removable and so you can easily clean the whole thing with a brush. This little product is made of metal. Thus, it is definitely durable and can be used for a long period of time. Plus, even though it is an all metal body it is quite light in weight. A carry handle is integrated into the body of this box fan which makes carrying it an easy job. Makers didn’t forget to add a cord wrap feature. As a result, you can neatly the store the cord when not using this device. I need not tell you how energy efficient the fan is and the amount it saves you in electric bills, do I? 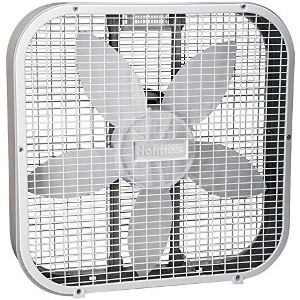 This 20-inch fan from Holmes is lightweight yet durable when push comes to shove. Cleaning this Holmes product is as easy as pie unlike what some of the users may think. Metal construction increases the durability and grants this box fan a long life. One can manage the power cord just fine as there is a box in which you can keep the cord wrapped. This is a fan with simple design and functions; don’t expect it to do too much. Like other box fans, this Holmes product doesn’t oscillate. This thing can be noisy at times. It is not uncommon when people ask others why they should get a box fan instead of other fans when it comes to air circulation. The thing is, I don’t suggest a random machine out of my hat. My idea is to choose among the best box fans that are currently in the market. Aerospeed Premium box fan is surely on that list of mine. Makers implemented a sleek and modernistic design that makes it suitable for any household. Secondly, this design is energy efficient in a number of ways. This box fan helps to save electric energy, which also helps you save financial energy (so to speak). The fan can be set up almost anywhere INSIDE the house. Aerospeed does not guarantee that this product will withstand water or moisture. It will be wise of you to not set up the fan on any window where it may get in contact with rainwater or harsh weather. 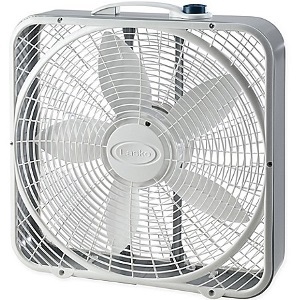 Unlike most fans, box fans such as the one made by Aerospeed have slimmer fan heads (all they have is a fan head). So, it takes very little space, even though it is 20 inches high and 20 inches wide. The slimmer body also allows you to store it anywhere you want. People can even store it under the bed or on top of their cupboards. Moreover, with the help of the carrying handle, you can carry it anywhere without much effort. The speed regulating dial is mounted on top of the fan head, where you can easily reach it. There are 3-speed settings to choose from. The blades have a proper pitch to provide strong wind flow. This little fan fits well with any kind of design you have for the household and its durable too. You won’t have to provide much of a space to this fan. It can do well in what little space it’s allowed. Aerospeed fan comes with a neat little “Carry Handle” that people can use to move it around. It does well to save you some energy and bills per annum. This Aerospeed fan is not particularly water resistant. Don’t set it up near a window with rainwater access. Sometimes, the word “Premium” gives us an extra layer of assurance when it comes to the quality of a product. A box fan is no exception Just look at the Lasko #3723 Premium Box Fan. I know there are a lot of Lasko products on my list. You’ll see more as you move through it. But I couldn’t resist. This is a 20-inch box-style machine with 5 blades (like other Lasko products on my list). The front and the back grill are both open and spiraled. So, air can flow through it without any hindrance and with a strong current. It weighs something around 6 pounds and so it is very easy to carry. In fact, it comes with a carry handle on top to help you carry it around. This Lasko product is ETL Listed. It is equipped with a fused safety plug. This safety plug cuts of power in case of an anomaly. There are three-speed things. The speed control dial is set on the top of the fan head. The position of the speed dial makes it easy to reach esp. when you have set it up on the floor. Just plug the fan in and select a speed setting and then sit down to enjoy a comfortable summer day by watching movies or listening to music. The motor is whisper quiet and runs smoothly even when running at the highest speed. The thing about this cooling fan is that it is designed for targeted air flow. Since it is 20 inches across, it can easily cover moderately large rooms. This little product is ETL listed and keeps the users safe from any unexpected accident. I like the “Speed Control System” of this fan; it is easy to reach and operate. Like other Lasko products, this one uses a “WhisperQuiet” motor for operation. It is good for bi-directional airflow in moderate-size rooms. With as many as 5 blades and spiraled grilles, it can circulate strong currents of air. To be honest, I didn’t find much of a difference between the three levels of speed. Holmes is a very familiar name when it comes to box-style fans. Their products offer durability, customer satisfaction, and affordable prices. The HBF2010AWM White Box Fan can be a great example. It is 20 inches high and 20 inches wide. The front and back grills are gridded to allow maximum airflow. Some people think cleaning fans is a matter of great trouble. But in reality, it is not so. The front grill is removable – you will need to manually unscrew the screws that attach the grill to the mainframe. After detaching the grill, you can easily clean the whole thing. You can set up the fan on any flat surface. Plus, it comes with a pair of attachable feet that provides added stability. 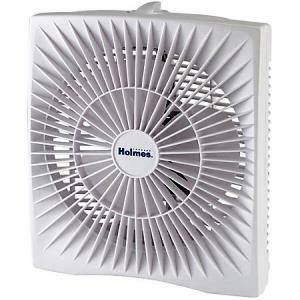 This Holmes product is one of the best-rated box fans in the market right now. It is made of metal, so it is definitely durable and can be used for a long period of time. Plus, even though it is an all metal body it is quite light in weight. A carry handle is integrated into Holmes HBF2010AWM which makes carrying it an easy job. It also has a cord wrap feature. And owing to this feature, you can neatly the store the cord when not using the fan. The fan has a slim body that lets you store the whole thing almost anywhere in the house. You can choose among three speed settings – high, medium and low. Holmes does not say anything about using this product as a window fan. So it is better to use indoors only. Holmes HBF2010AWM has a removable grille. This makes cleaning it easier than others. Metal construction grants it durability and longevity at the same time. The slim design of this baby allows you to set it up anywhere in the house. The HBF2010AWM comes with a carry handle that lets you lift it and carry it with ease. The attachable feet give this fan stability when it needs. It can be quite heavy and needs appropriate support. Don’t hate me when you see so many Lasko products named as best box fans. This is one brand I am comfortable with and can vouch for. So when I sat down for this review article of mine, I made educated guesses to include a number of products manufactured by Lasko. The B20401 is a slim, catchy, and reliable solution to fend off the hot spirits of summer. This box fan comes fully assembled and you can start enjoying a comforting breeze just after unboxing it. 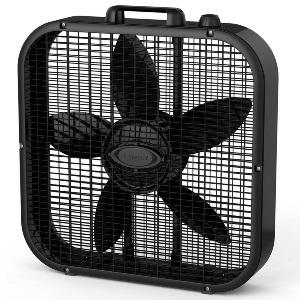 This 20-inch fan along with the 5 perfectly pitched blades can provide a strong and steady airflow on any hot day. The fan can be set up on any flat surface, be that the floor, table or your bed. The motor of this Lasko B20401 box fan runs smoothly even when you have selected the highest speed. There are 3 quiet speeds which you can select by simply turning the regulating dial mounted on top. The fan is designed including “Save Smart” Technology. This little technique saves energy and your money every hour. Unlike some of the other Lasko products, this box fan does not come with a Weather Shield Motor. So, I suggest not using the B20401 as a window fan where it may get in contact with water and moisture. This “Amazing” product weighs only about 7 pounds. So you can guess that carrying it will not be much of a big deal. Plus, it has a carrying handle mounted on top that just makes the whole matter of carrying the fan much easier. The fact that it has a height of 20 inches means users will have constant and strong air movement. Three levels of speed are easy to switch between thanks to the “Dial-Style” control system. I found the fan surprisingly light weighing only 7 pounds. As with all the Lasko products I chose, this one has an attractive design too. In addition to a nice design, it boasts a seamlessly blended “Carry Handle” for portability. The motor isn’t “Weather Shielded” like other fans; you can’t expose it to water. Not everybody would be interested in getting a 20-inch box fan. Maybe you don’t have much space in your studio apartment. Or maybe, you don’t need such a big fan anyway. So, here is a 10-inch personal size box fan (don’t curse me for referring a box fan to replace another) manufactured by Holmes. This box fan is extremely lightweight (it weighs only 3.4 pounds) and so you can effortlessly carry it anywhere anytime. The carrying handle only adds to this effortlessness. This is a very stylish yet space saving product. It suits every kind of household. And we even suggest that you can use it in office areas. You can set it up anywhere you want in any way you want. This fan lets you enjoy a cool breeze at a very low cost. From my experience, I didn’t find anything that would tarnish the reputation of this fan. On the flip side, it enjoys the rare blessing of having numerous happy customers. However, one thing that might seem to you to be a demerit is that it has only two speed settings – just high and low. In any case, I believe it will not be a reason for your disappointment. The motor runs smoothly and makes moderate sounds (few users might disagree on this point). One can enjoy a relaxing afternoon with this Holmes box fan whispering away nearby. The front grill is specially designed so that the fan can provide a steady and focused air flow. The three wide and perfectly pitched blades pull in the air and provide a strong wind current toward your direction. This is one of the most lightweight personal fans around as of this date. This little product does incredibly well to save space for a small-size apartment. Beginners will have fun interacting with just the two-speed settings of this box fan. The airflow is steady and intense from up close. Just what you expect from a personal fan. This fan can be a bit noisy for people’s liking. Just the two-speed levels put the fan in a binding. The hot season of summer is upon us and winter won’t be here anytime soon. During this time if you don’t want to spend too much on cooling fans and looking for something simple, get the Lasko 3733 cooling fan. It as simple as fans can be. Don’t underestimate this Lasko product just because it does not cost much and is simple in design. This is a 20-inch box fan also comes with 5 blades. The front and the back grill are both open so that air can flow through it without any hindrance. The fan itself is lightweight in weight (weighs something around 6 pounds) and so it is very easy to carry. It even has a “Carry Handle” on top to assist you. This is an ETL Listed product and it is equipped with a fused safety plug. This safety plug cuts of power if it detects an anomaly. There are three-speed things. The speed control dial is set on the top of the fan head. All you need to do is to plug the fan in and select a speed setting and then sit down to enjoy a comfortable time. The motor is whisper quiet and runs smoothly even when running at the highest speed. The thing about this cooling device is that it is designed for targeted airflow. The fan head does not oscillate and it also cannot be tilted. To get best results you would have to sit in line with the fan. One can freely open and close the front and back grilles to his/her advantage. The design of this product encourages hassle-free airflow and cleaning. Operating this fan is as easy as plugging it in and selecting the speed level. I do like this Lasko product for the speed dials and 3 different speed levels. The fan can’t be tilted and it cannot oscillate. One would have to sit in line with the airflow. Which Features Should You Prioritize When Looking for a Product? Buying a boxed fan is not rocket science. If by any chance, the list doesn’t give people a product they want, they can opt for their own research. Thus, they’ll end up choosing their own brand and model. This part of the article makes selecting new products easier. I’ll give you factors that you should judge before you hit the “Buy” button. How is the CFM Rating? Since box-style fans are small, you cannot expect too much from them. We need to accept that they are good for air circulation and occasional air boost only. With that in mind, you should look for the CFM (Cubic Feet per Minute) count. It tells you how much space these products will cover with air. The Higher the CFM rating, the better it is. Alternatively, measure what how big or small the space of yours is, then go for a fan which best covers the room. People garner the misconception that larger fans have higher CFM ratings. But it is not always the case. You need strong motor and blades to drive air. Make sure that you have easy-to-access controls. I prefer them right at the top where my hands can reach them. Detailed control panels with many options are always welcome. But beginners may face difficulties operating them. One solution is having a remote control with detailed controls while the fan houses only basic buttons. These remotes may need batteries too and will cost you more bucks than the ones with “No Remotes.” Spend your dollars wisely depending on how much convenience you need. I prefer a noiseless fan which focuses only on cooling the room. But there are some who prefer their fan to make some sort of noise when it operates. Don’t laugh but there are people who depend on a bit of noise to sleep better at night. However, “Out of Control” noise can become a problem real fast. I recommend a fan which is noiseless due to my liking. You’d find Lasko products excelling in that area. However, if you don’t get one that’s “Noiseless,” go for those which produce less noise (preferably under 0.5 Sone in rating). Is the Fan Safe to Handle? A grilled fan is often safe, right? No. Especially, if you have kids at home. Kids and pets like to tinker with things. Fans with motor parts exposed or sharp blades can prove to be hazardous for them. Thus, my advice would be to buy one with a strong construction. ETL rating or certification helps too! This way, you know that certain fans are safe. Prominent brands even guide you against sudden spikes in voltage or electric short circuits. Majority of my best box fan candidates come with a safety plug installed. Others have a strong build that protects kids and pets. Buying the top model and running it is part of the solution to the “Heat” problem. You need to maintain it well (I’ll be picking this up later). These products can get pretty dirty at the parts which are exposed. So, the grilles and blades are prone to get dirty. I’ve included models which you can open up both from the front and the back. If users put their minds to it, they can unscrew the blades and clean them separately as well. Just be sure to put them back together piece by piece after you are done. As a user, one should pay close attention to the number of blades. Blades draw the air and let it out. 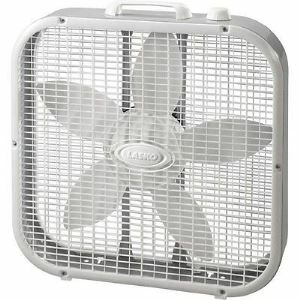 I prefer a box fan with four blades (as a minimum requirement). But if you find one with five or more, take it with both hands. People already know that these fans don’t oscillate. They won’t rotate. But still, you can find fans which allow you to tilt them a bit. This way, one can dictate the path of air by some degree. I think it is a useful advantage to have during hot and humid days. Box fans are usually placed inside the house. Some of the high-end fans will allow people the convenience of “Water Resistance.” You can use these near the windows. There are window fans that that function as box fans too. Be on the lookout for those. Checking if the fan saves you some energy and electric bills is a good idea. Most fans’ energy saving prowess will be labeled by the makers. Other than those, you can save power by regulating the use of the fans. Try and regulate speed levels regularly. Also, be sure to check for automatic shutoff feature for fans to prevent excessive use of electricity. How to Maintain the Fans Properly? Buying the best-rated box fans and ensuring their longevity are two different things. One should be able to use these devices properly to prevent any accidents. Another thing to look into is how you clean these things which are easy when you have a grasp on things. One should be able to open up the front and the rear part of the fan using a simple screwdriver. Once opened, carefully pick apart the blades and the motor. Cleaning the motor with a dry cloth will be a good idea. For blades, use a brush to dust off. After that, one can pick them apart and clean them with a cloth soaked in warm water. After you done the cleaning, gently put everything together. Let’s End It on a High! I commend my readers for giving my article on best box fan choices a reading. As you guys noticed, there are no shortages of quality box fans. One just needs to know where to look and which models to target. This little guide is also helpful for people who want to do their own research into these things. The right product will make your life easier than before. Choose wisely and you’ll have your hands on a machine that does the job without cutting your wallet too deep.